The Apache Cassandra database is the right choice when you need scalability and high availability without compromising performance, and with no single point failure. Hackolade was specially adapted to support the data modeling of Cassandra, including User-Defined Types and the concepts of Partitioning and Clustering keys. It lets users define, document, and display Chebotko physical diagrams. The application closely follows the Cassandra terminology, data types, and Chebotko notation. Azure Cosmos DB is Microsoft's globally distributed, multi-model database to elastically and independently scale throughput and storage across any number of Azure's geographic regions. Hackolade was specially adapted to support the data modeling of multiple document types within one single collection. Each Document Type is modeled as a separate entity, so its attributes can be defined separately. We support both SQL API (formerly known as DocumentDB API) and MongoDB API. To be added soon: Table API, Gremlin API, and Cassandra API. Couchbase Server has become the de facto standard for building Systems of Engagement. It is designed with a distributed architecture for performance, scalability, and availability. It enables developers to build applications easier and faster by leveraging the power of SQL with the flexibility of JSON. Hackolade was specially adapted to support the data modeling of multiple object types within one single bucket. Each Document Kind is modeled as a separate entity, so its attributes can be defined separately. Amazon DynamoDB is a fast and flexible NoSQL database service for all applications that need consistent, single-digit millisecond latency at any scale. It is a fully managed cloud database and supports both document and key-value store models. Its flexible data model and reliable performance make it a great fit for mobile, web, gaming, ad tech, IoT, and many other applications. Hackolade was specially adapted to support the data modeling of DynamoDB tables including partition (hash) and sort (range) keys, supporting multiple regions as well. When you get answers instantly, your relationship with your data changes. Elasticsearch is a RESTful search and analytics engine based on Apache Lucene. It provides a distributed, multitenant-capable full-text search engine with an HTTP web interface and schema-free JSON documents. Hackolade was specially adapted to support the data modeling of Elasticsearch, including the large choice of data types, and parent-child relationships. We dynamically generate mappings for forward-engineering, and infer schema through document sampling and mappings if available. The Google Firebase Realtime Database is a cloud-hosted database. Data is stored in JSON and synchronized in real time to every connected mobile or other client. It lets developers build rich collaborative applications, with data also persisted locally, to give users a responsive experience. Hackolade was specially adapted to support the data modeling of data stored as a large JSON tree, with data nodes and their associated keys. Note: the forward- and reverse-engineering of schemas are not currently available. They're being developed and will be released at a later time. Hackolade was specially adapted to support the data modeling of data stored in collections, nested objects, and subcollections. Apache HBase is an open-source, distributed, versioned, non-relational database modeled after Google's Bigtable. This project's goal is the hosting of very large tables -- billions of rows X millions of columns -- atop clusters of commodity hardware. Hackolade was specially adapted to support the data modeling of HBase, whether you store your data in column families or as a JSON object. With our reverse-engineering function, you can easily discover, document, and enrich the structure of your column families and qualifiers, plus infer the structure of JSON documents you store in HBase. Apache Hive is an open source data warehouse system built on top of Hadoop for querying and analyzing large datasets stored in Hadoop files, using HiveQL (HQL), which is similar to SQL. HiveQL automatically translates SQL-like queries into MapReduce jobs. This provides a means for attaching the structure to data stored in HDFS. 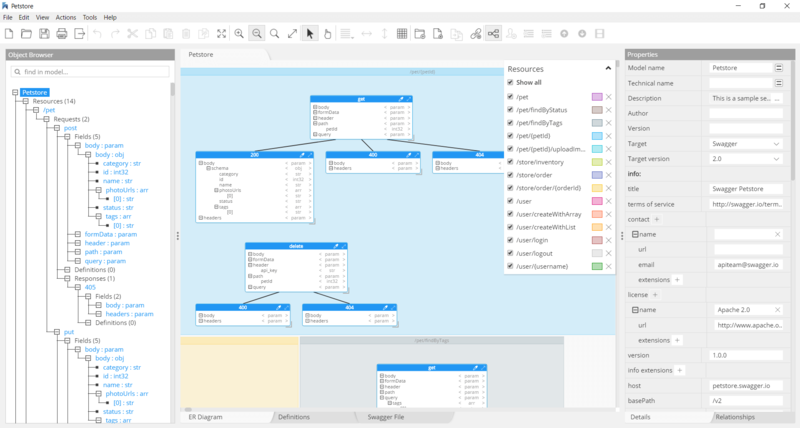 Hackolade was specially adapted to support the data modeling of Hive, including Managed and External tables and their metadata, partitioning, primitive and complex datatypes. It dynamically forward-engineers HQL Create Table scripts, as the structure is built in the application. You may also reverse-engineer Hive instances to display the corresponding ERD and enrich the model. The application closely follows the Hive, terminology and storage structure. MarkLogic is designed from the ground up to make massive quantities of heterogeneous data easily accessible through search. MarkLogic is a leading 'multi-model' database, supporting JSON documents and RDF triples, all with ACID transactions capabilities. Hackolade was specially adapted to support the data modeling of MarkLogic, including the JSON definition of model descriptors, geospatial structures, triples and quads, and sub-collections. The application closely follows the terminology of the database. Note: forward-engineering of JSON Schema is available for use by xdmp.jsonValidate. Reverse-engineering of schemas is not currently available, and will be released at a later time. MongoDB can help you make a difference to the business. Tens of thousands of organizations, from startups to the largest companies and government agencies, choose MongoDB because it lets them build applications that weren’t possible before. With MongoDB, these organizations move faster than they could with relational databases at one tenth of the cost. Hackolade was specially built to support the data modeling of MongoDB collections, pioneering a new set of software tools to smooth the onboarding of NoSQL technology in corporate IT landscapes, reduce development time, increase application quality and lower execution risks. Neo4j is a graph database management system described as an ACID-compliant transactional database with native graph storage and processing. Hackolade was specially built to support the data modeling of Neo4j node labels and relationship types. It provides a graph view with familiar circular node labels, as well as an Entity-Relationship Diagram view with permanent display of the attributes (or properties) of both node labels and relationship types. Hackolade dynamically generates Cypher code as the model is created via the application. It also lets you perform reverse-engineering of existing instances, so you can enrich the model with descriptions and constraints, then produce a complete, clickable HTML documentation for distribution to all application stakeholders. The application closely follows the terminology of the database, pioneering a new set of software tools to smooth the onboarding of NoSQL technology in corporate IT landscapes, reduce development time, increase application quality, and lower execution risks. Hackolade is not a graph visualization tool, but a tool for schema design of Neo4j graph databases. JSON is increasingly dominating the application development world, especially when the target platform is mobile. Hackolade is a visual editor of JSON Schema draft v4. It supports all the advanced features, including choices and polymorphism. With Hackolade, it is easy to visually create a JSON Schema from scratch, and without prior knowledge of the syntax. You can also easily derive JSON Schema from JSON document files. Apache Avro is a language-neutral data serialization system, developed by Doug Cutting, the father of Hadoop. Avro is a preferred tool to serialize data in Hadoop. It is also the best choice as file format for data streaming with Kafka. Avro serializes the data which has a built-in schema. Avro serializes the data into a compact binary format, which can be deserialized by any application. Avro schemas defined in JSON, facilitate implementation in the languages that already have JSON libraries. Avro creates a self-describing file named Avro Data File, in which it stores data along with its schema in the metadata section. Hackolade was specially adapted to support the data modeling of Avro schema. It closely follows the Avro terminology, and dynamically generates Avro schema for the structure created with a few mouse clicks. Hackolade easily imports the schema from .avsc or .avro files to represent the corresponding Entity Relationship Diagram and schema structure. Hackolade takes a visual schema-centric approach so you can focus on the content of requests and responses. The application also assists with all the metadata to produce validaded Swagger files and test the transactions. You can also reverse-engineer existing Swagger files in JSON or YAML to produce a graphical representation of your APIs.